Avast! is my favorite and frequently recommended free antivirus suite. Today, Avast! announced that version 6.0 will be coming soon. With the version update, it’s bringing some cool technology with it. Both the free and paid versions will be getting an automatic sandboxing capability with this new version. AVAST Software is including an array of new technologies in its soon-to-be released avast! 6.0, including virtualization technology for all of its free users. Virtualization technology enables people to create a ‘virtual’ computer inside their physical machine. If they encounter malware while browsing the internet or running an infected application, the virtual computer will shut down, leaving their real computer unharmed and running. “Most viruses are spread through executable commands and scripts are the entry point. By isolating the binary in a virtual computer, the real machine stays clean,” explains Mr. Vlcek. 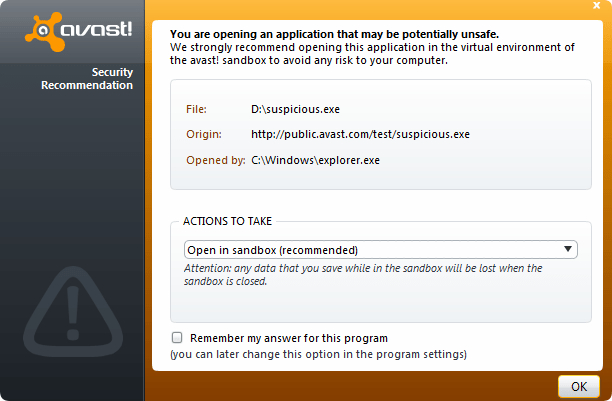 AutoSandbox identifies and prompts users to run suspicious applications in a safe virtual environment. Users have three options: execute the file within the virtual AutoSandbox, run it outside the sandbox, or cancel running the application entirely. “It’s a win-win for users, if the item is dangerous it just shuts down the virtual computer and the user’s real machine remains safe. And, if the item is safe, there is no hassle from a false positive,” adds Mr. Vlcek. The new feature will be available at no cost to all avast! users – including those with avast! Free Antivirus, Pro Antivirus, and the premium Internet Security suite. Could Google Fiber become the only ISP?